We are passionate in providing a complete gardening service to the highest levels of presentation. Let us take the strain out of your garden, sit back and enjoy your spare time! FROM MOSS & LAWNS, TO WEEDS & YOUR FAVOURITE FLOWERS. At Crown Gardens and Landscapes we know that no two gardens are the same, we will tailor our service to fit with your budget and requirements. Big or small we love them all. Providing a complete Grounds Maintenance solution, we pride ourselves on an extremely high standard of work. Tailored maintenance programmes to each business with Health and Safety at the forefront of our everyday activities. WE CREATE THE GARDENS YOU WANT TO BE IN. Revitalising garden landscapes is our speciality, whether that is a simple repair or a complete re-design, we work with you on a consultative basis to ensure that we personalise your outdoor space, making your garden truly unique. At Crown Gardens and Landscapes we know that our customers are looking for a reliable and professional service from their Garden Maintenance Service or Landscaper. 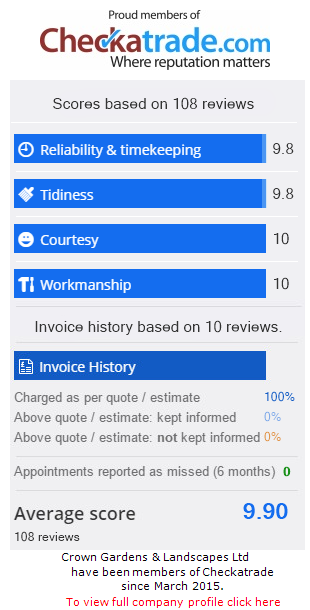 Check us out at Checkatrade to see what other customers have got to say about our service, you won't be disappointed. Why use Crown Gardens & Landscapes? At Crown Gardens and Landscapes we have vast experience and a reputation for creating, maintaining and transforming gardens for both Residential customers and Commercial Clients. Our teams of professional, friendly and reliable Gardenites are passionate about Gardening to very high standards of presentation and quality workmanship. As proud members of Checkatrade we aim to exceed our customers expectations on every occasion no matter how big or small. All our Gardenites offer high levels of customer service, are highly courteous with exceptional attention to detail, ensuring you of an immaculate garden with a smile every time! We provide a consistent, reliable and seamless service to all our customers. Ensuring that communicating and payment methods are as simple as possible; we really want you to enjoy your garden in your spare time. Health and Safety is very important to us and accreditations are taken annually, so you can rest assured, that at all times our teams of Gardenites have both yours and their Health and Safety at the forefront of all work undertaken on your premises.